Kevin Garnett is one of the greatest Power Forwards in NBA history. He has played with such a toughness and aggression that allowed him to earn a MVP award, a NBA Championship, and countless All Star appearances. He is the only player to reach 25,000 points, 10,000 rebounds, 5,000 assists, 1,500 steals, 1,500 blocks and he has such a storied history after 21 years in the game that you almost didn't expect him to ever walk away from the game and retire, but that's exactly what happened this past weekend when KG said goodbye to the game of basketball. Today, we thank him and look back on his great career. We honor one of the greats. Tim Duncan and Kobe Bryant. Two of the three most significant players of my generation have all retired this offseason and now the third joins them. Kevin Garnett announced his retirement and it's time to look back on one of the most (ironically) quietly dominant players ever. This was a man that could honestly do everything Tim Duncan did, but was just FAR more athletically. His mid range game was excellent, his ability to take a defender off the dribble was amazing for his size, his quickness and explosiveness were unreal and he had an intensity on defense rarely matched by his opponents. Known for his incredibly boisterous personality, he definitely rubbed some people the wrong way as the NBA's poster child for the guy you'd hate playing against but would love playing with. In addition to that, he was the guy you pointed to as an example of that Hall of Fame caliber player that needed to be saved by being sent somewhere he could win. And when he finally got that chance in Boston, he didn't disappoint. Anchoring one of the best defensive units since the mid 2000s Pistons, KG won Defensive Player of the Year and his first and only NBA Championship. However, it's only fitting that after year 21, Number 21 retires at home in Minnesota. It's been a hell of a career and I can't wait for his Hall of Fame speech. The Big Ticket. He's a champion, multiple time All-Star and all around warrior. 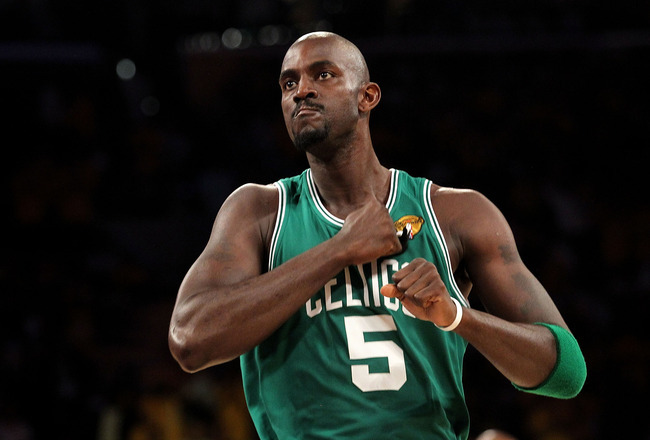 Garnett came in fresh out of high school and made an immediate impact on the game. He took the Wolves to the playoffs in his 2nd season and then continued it with 8 consecutive playoff berths. 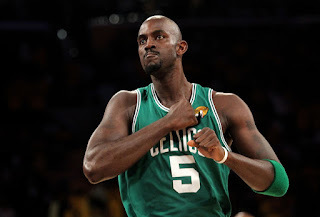 Garnett had a nice array of moves for a big man and is arguably the original "stretch 4". When he got to Boston, it just felt like a perfect fit. His chemistry with Pierce and Allen and coach Doc Rivers was instant. He became more vocal and embodied passion in a slugfest of a Finals which led him to his only championship. He was the heart of those great Celtics teams as they were perennial playoff contenders. Now, KG fell off some during his horrendous Brooklyn stint but you could never say he didn't give it his all. He was purely a mentor and pseudo coach in his last run with Minnesota and he just couldn't go anymore the same. He was a trailblazer in the NBA regardless: one of the inaugural high school players to skip college and he was amongst the first of the superstars to start the "chasing rings" trend. With Kobe, Duncan and now KG riding in the sunset, the NBA will surely miss the last of the golden age. Look for Dirk to join that list shortly. The king of trash talk is officially gone. 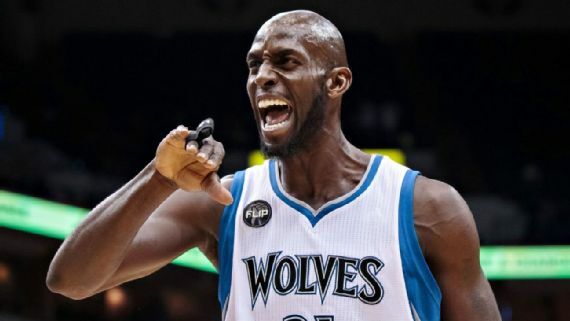 Kevin Garnett's rumored retirement was made official Friday and the basketball courts suddenly got quieter. It's a damn shame to me because of who he was. 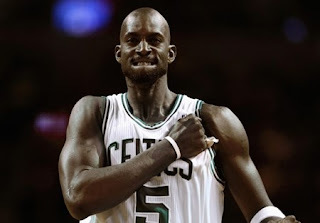 Garnett didn't give a damn and he was proud of that. He could talk all that because he could back it up. I just wish he would've ended up on better teams earlier in his career because he could've won at least 2 more championships, perhaps if he went with the Spurs in their championship prime, or even the Heat at some point during the beginning of their run. Regardless, he will be missed. Cheers, KG. Before Kevin Garnett, players coming straight out of high school were an anomaly. Only Moses Malone had skipped college before the 6'11 future Hall Of Famer made a decision that was criticized at the time. He was the 5th overall pick in the 1995 draft and although he didn't have an immediate impact his rookie year, the talent was evident. The mobility, post game, jump shooting, handle and defensive prowess of the near 7 footer made for a unique skill set that wasn't seen at the time. His 2nd year, he made the 1st of 15 All Star appearances, becoming the 1st Timberwolves player to receive the honor after they entered the league in 1989. Many times in his career, he would quickly transform his team and he lead them to the 1st of 8 playoff appearances in 1996-97 season averaging 17.0 PPG, 8.0 RPG and 2 BPG, and it was obvious the teenager was headed for a special career. He and Stephon Marbury had a potent 1-2 punch, but youth and egos derailed that combination early as we only got to see them for 3 years. This started Kevin Garnett having a weak supporting cast, but his versatility was on full display his 1st year without Marbury. In 1999-2000, he averaged 23.0 PPG, 12.0 RPG, 5.0 APG, 2.0 BPG and 2.0 SPG. His superstar status had arrived as he was an Olympic medalist in 2000 and regarded as one of the best power forwards in the league. Unfortunately, he had multiple 1st round exits mainly due to the thick competition in the Western Conference in the early 2000's. However, 2003-04 is when he finally had a quality team around him with the additions of Veterans Sam Cassell and Latrell Sprewell along with the only other All Star caliber player who was with Garnett years prior in Wally Szcerbiak, and Garnett responded with a MVP award and his best season in his career. Averaging 24 PPG, 14 RPG, 5 APG, 2 SPG, and 2 BPG, he led his team to the Western Conference Finals until they ran into the buzzsaw that was the early 2000's Lakers dynasty. Unfortunately that team was disbanded shortly afterwards and Minnesota went through a youth movement against Garnett's wishes. He played with a plethora of teammates and missed the playoffs a few times before finally in 2007, after 12 years in Minnesota, he requested a trade. On July 31st, he was traded to the Boston Celtics to play alongside other future Hall Of Famers Ray Allen and Paul Pierce. Garnett changed the culture immediately. He was a huge catalyst for them going 66-16 and winning the NBA Championship in 2008. 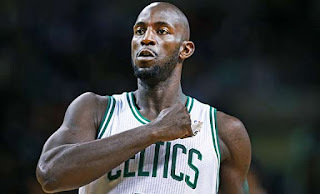 Garnett was notorious for playing practices as hard as games and instilled confidence in Kendrick Perkins, transforming him into one of the best post defenders in the league, gave Tony Allen a new identity as one of the best wing defenders in the league and turned the Celtics to Elite for a 4 year run. Unfortunately in 2009, when the Celtics were number 1 in the east in a February game against Utah, Garnett came down wrong on an alley oop and suffered a major knee injury that took him out for the remainder of the season. His absence was noticeable as the Celtics got eliminated in 7 games in the 2nd round to the Orlando Magic. 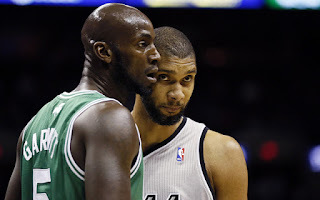 Although the Celtics had a Finals appearance in 2010, and a surprise Eastern Conference Finals appearance in 2012, it was obvious Garnett wasn't the same magnified by the 3 rebound performance in game 7 of the 2010 finals. After a 1st round exit to the Knicks in 2013, Garnett was traded to the Nets, where it was obvious he was holding on too long and his passion overrode listening to his body. He then was traded back to where it all started and mentored an extremely talented roster of upcoming players including Karl Anthony Towns, Andrew Wiggins, and Zach Lavine. While only appearing in 38 games, his advice was taken and utilized. Kevin Garnett is the only player in NBA history to accumulate 25,000 points, 10,000 rebounds, 5,000 assist, 1,500 steals, and 1,000 blocks, and is the only player to lead a franchise in all 5 categories. Kevin Garnett has transcended the game as one of the 1st mobile power forwards with guard skill shooting ability and you can see his influence in the likes of Anthony Davis, LaMarcus Aldridge, Karl Anthony Towns, etc. Kevin Garnett will be missed and I can't wait for his Hall of Fame speech in 5 years, thank you for bringing a championship to the Celtics. Another great leaving the game. Man it's too crazy to me. Kevin Garnett to me will go down as one of the best bigs to play the game. As a Laker fan, I hated when we played KG, but as a basketball fan, I can appreciate what he brought to the game. KG played with so much nastiness and intensity that you either hated it or loved it. He wore his emotions on his sleeves and left it all out there. 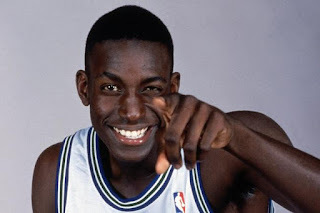 KG also was a very clever trash talker too, which is something you don't see much of everyday. You knew he was going to do everything to get into your head and bully you around. KG was actually one of a kind. They always say appreciate the good players while they're there. Garnett retiring signals an end of an era. 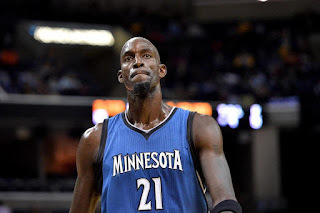 Thanks for everything, KG. -We've lost a lot of legends this season. It is a transition. After Kobe, Duncan, and KG leaving, there's not many left to go. Next, we'll be waiting on Wade, LeBron, Melo, and guys like that to retire in the next 3 or 4 years. It's the reality and the evolution. KG is one of the greatest power forwards of all time, and while the game will miss him certainly, his legacy will always live on. Forever. Thank you KG.